I could have run a review of Austria’s Goodnight Mommy when it opened in New York and Los Angeles back on September 11. I could have run a review when it opened in Seattle a week later on September 18. The honest truth? I simply did not know what to say. Incredibly well made, freakishly evocative and unsettling, this terrifying psychological drama left me so shaken when it was over I was close to aghast as to what it was I had just witnessed. While the film is remarkable, I found I didn’t want to talk about it with anyone let alone write down my thoughts on paper, writer/directors Severin Fialaa and Veronika Franz doing such a grand job scaring my psyche all I really wanted to do was go home, climb into bed in a fetal position and hope I didn’t have nightmares. The thriller reminds me of classics like Claude Chabrol’s L’Enfer, Roman Polanski’s Repulsion, Mervyn LeRoy’s The Bad Seed, Jack Clayton’s The Innocents, Michael Haneke’s The White Ribbon and Cristian Mungiu’s 4 Months, 3 Weeks and 2 Days, all representing a variety of genres and cinematic styles yet all fearlessly reaching for conclusions that are hardly heartwarming. They go for the jugular, paralyzing audiences to such an extent they exit the theatre shaking, wondering what the heck it was they had just sat there and experienced. Fialaa and Franz are unafraid of extremes, determined to go right to the precipice of damnation before willfully jumping in with both feet, cheerfully waving at the viewer as they do so. Twins Lukas (Lukas Schwarz) and Elias (Elias Schwarz) live in a secluded modern house on the outskirts of town. Their loving Mother (Susanne Wuest) has been away for facial surgery, returning home bandaged to the point she’s completely unrecognizable. The two boys are immediately wary, especially as she seems intent on only recognizing one of them, acting like the other lad doesn’t exist. 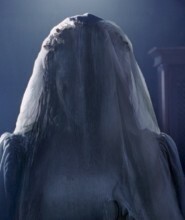 Soon, Lukas and Elias become convinced this is not their mother, and if no adult is going to listen to their concerns then they’re going to do whatever it takes to ascertain the truth. 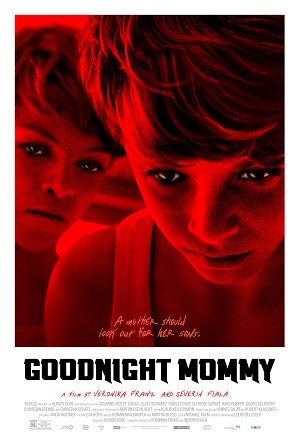 I can’t classify Goodnight Mommy as a horror film even though the end result is absolutely horrifying. As eerie as it is, as spine-chilling as the two filmmakers make everything, it’s hard not to look at this as a character-driven psychological drama dealing intimately with ideas of grief, loss, brotherhood and identity. The actual twist hiding within the serpentine coils of Fialaa and Franz’s screenplay isn’t difficult to figure out, the truth an open secret revealed within the opening montage of the two twins outside playing. It’s the mental stuff, the way they are dealing with their suspicions in regards to their mother, that’s the true craziness that’s taking place, seeing it all spiral so ghastly out of control so disconcerting watching it come to culmination is akin to an endurance test. Like a delicate, devilish combination of Douglas Sirk, Alfred Hitchcock, Alain Resnais and Stanley Kubrick, the film’s visual allure is a slow burn of a tempered perspective, Martin Gschlacht’s (Revanche) cinematography and Michael Palm’s editing having a seamless artistry to them both that’s uncomfortably astonishing. Combined with Olga Neuwirth’s powerfully minimalistic score and Hubert Klausner and Hannes Salat’s suitably modernist production design, the overall effect is insidiously palpable, and as events progressed I found myself becoming a tense ball of angst and apprehension the closer they came to culmination. The constant weirdness is perplexing. Why does a mother, apparently recovering from some sort of trauma, leave children home on their own with no adult supervision for some undisclosed period of time? Why is her surgery not discussed more beforehand? What does a cavern of human remains signify? Is it real? The boys’ mutual fondness for insects, the creepier and the crawlier the better, where does it come from? When the two start expressing concern all is not as it appears why is there never a suggestion to sit down with therapist? How come a doctor or a nurse never checks in with the mother to see how she is healing? Yet, all the same, this “Twilight Zone” atmosphere that Fialaa and Franz go out of their way to develop so meticulously and with such demoralizing rationale is fitting, the power of the finale incumbent on the fact so many questions are hanging over the proceedings like a guillotine ready to sever the head from its neck. It’s this continual omnipresent dread that defines things, the filmmakers doing such a grand job of maintaining it I could not help but be impressed. All of which makes it even harder for me to admit that, as stupendous as Goodnight Mommy might be, that I’m not entirely certain I’d ever want to willingly watch it again. Fialaa and Franz are talented, and I am fully behind Austria submitting this terror of a drama as the country’s entry in the Best Foreign Language Film Oscar race as it’s just that masterfully composed. But the sense of despair, the calamitous nature of so much that transpires, the almost repellant atmosphere that is created, all of it just made me so ill at ease I don’t think I could handle experiencing those emotions for a second time. Whether that’s a reason for others to watch the film for themselves, well, I’ll leave that up to all of you to decide one your own.